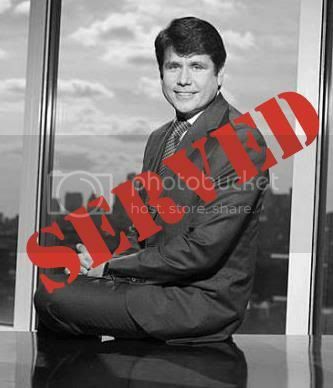 SERVED: For weeks, disgraced ex- Illinois governor Rod Blagojevich has been a plague on The Celebrity Apprentice. He was a poor worker, always mugging for the camera or passerbys, and a moron... so of course that makes good TV. Clearly the man should've been fired the past 2 weeks for being incompetent but he wasn't. Finally, Rod got SERVED. After being volunteered by a teammate to be project manager on this task, Rod and his RockSolid team were in for a shock when it was announced it was a telecommuting task. Well Rod doesn't know how to email or text message because "he's never had to at work." OK, that excuse might be legit 17 years ago when you were struggling to get by using Prodigy, but it's 2010 and even grandparents and toddlers can send an email. Rod also refused to make any real decisions and delegated all the work to his teammates for their promotion for The Wizard World of Harry Potter, thus putting the blame on them. After completely botching the Harry Potter lexicon (he called the school "Hogworths" and one of the houses "Slithering") and not even knowing about the attractions at the park, he refused to own up to it and tried to use his politician talk to get out of it. It didn't seem to matter anyways because it was soooo obvious Donald Trump wanted to fire Brett Michaels. This is when I get irate because I don't think any reality show is quite as fixed as this show, but thankfully Trump had the good sense to fire Rod and finally give him the SERVING he deserved. Rod, you're a moron. And I can easily say this because you wouldn't even know how to Google yourself. SERVED!